A quiet day at the beach in Ingonish, Cape Breton Island. August 30 to September 3, Maritime Beaches — After the tourist explosion of Cavendish and the superfluous extravagance of the Chinese Junk Boat tour the night before, my travel partners and I decided we weren’t going to schedule anything more but rather, let Day 2 in PEI take us where it would. I now know that this approach is so much better for someone like me who is crazy about scheduling and always being “on time”. Mike’s Eagles Glenn golf experience in Cavendish hadn’t been the greatest so he was wary. 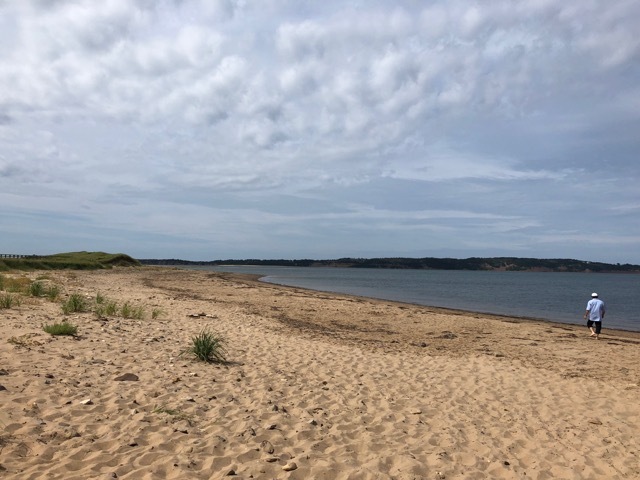 Angela and I however had had a great day at Cavendish Beach although our time there had been cut short by my distraction at LMM Montgomery’s childhood home (see an earlier post). Still, the red cliffs at the beach were stunning and the water was clear and quite warm. I’d left my phone behind so no photos. You’ll just have to take my word for it. I haven’t spent a lot of time on beaches since we bought our river front cottage over a decade ago. 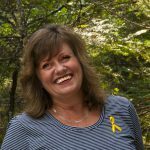 Since then, and pretty much during our children’s entire lives, our time in the water has usually happened jumping off floating docks and boats. In PEI and all throughout Cape Breton Island, I rediscovered my love of beaches. And these aren’t just any beaches, but sprawling expanses of sand and rocks swept clean by rolling ocean waves. 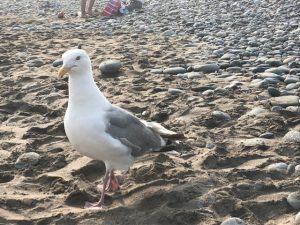 Pretty sure these guys are part of the reason Maritime beaches are so debris free. Maritimers seem to have an inherent respect for the land. There’s definitely a code of conduct for public places and attractions like the beaches and hiking trails where I saw very little garbage left behind. Beaches became a bit of theme during the entire vacation, starting with a great day at Lawrencetown Beach on our first day where our daughter, who now lives in Halifax, showed off her new surfing skills. There were numerous stops at beaches all along the Cabot Trail, and while I didn’t collect their names, I did collect rocks at every single one. Flat lovely stones I plan to make part of my dream catchers. I love that this eastern connection will be part of the story of the catchers I create for family and friends. I was actually thinking of who I’d like to give each of the stones to as I picked them. It’s unlikely I’ll remember who a particular stone was destined for but just stopping (and stooping) to pick them up helped connect me to both the present moment and the places we stopped. They are evidence that I was there. Relaxing on the “singing sands” of Basin Head beach. While still in PEI, we’d heard that Basin Head beach was great, had a cool bridge people jump off of and best of all was free! Enroute we realized we were passing by another golf course, Crowbush, that was on Mike’s bucket list. Since we didn’t have any deadlines, we decided to drive in to see if it would be worth the green fees and indeed, as the ocean rolled out beyond the impeccable fairways, we decided it was. 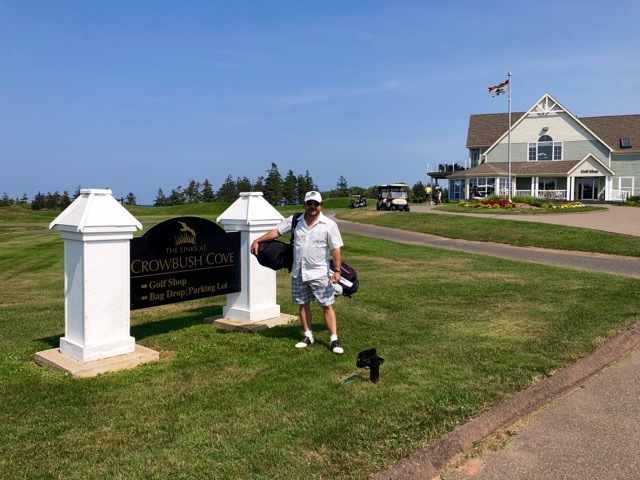 Michael Fournier can tick this one off his bucket list: Crowbush Cove Golf Course. We left Mike behind with plans to head onto Basin Head and swing back for him in a few hours. Angela and I loved Basin Head, had some idle time to talk about all of her hopes and dreams, as well as her worries, for her third year of university that would start in less than a week. I’ve since read that the beach is often called “Singing Sands”in reference to the pure white sand that “sings” as you walk through it, due to a high silica content. I don’t recall hearing any such “singing” and neither of us ever did jump off that bridge (it was a little too kitschy for us) but wandered off the beach quite late, much more relaxed than the over scheduled, overpriced day before. Best of all, we found a lobster fisherman along the way and stocked up on 3 succulent 1.5 pounders for an amazing meal back at our B & B. As the warmed butter dripped down our faces, we all decided we prefer to eat lobster this way not just because it’s at a fraction of the price of a restaurant meal but because we can dig in, make a mess, and enjoy the comfort and comradery of all of this in our own time and place. Photos also weren’t taken during this small extravagance out of respect for a family member (aka Ren) who wasn’t with us. It would have been too painful for him to watch! All and all, it was the perfect ending to a great rejuvenating, unscheduled day. Check out other #eastcoastwearehere posts on the stories page. One of our last beach stops near the end of the Cabot Trail.